Outlander Season 3 is months away from its release and has created an air of excitement amongst the fans already. The latest shocker that has been revolving around like headlines of magazines is the number of episodes chopped off from the upcoming third season. But all thanks to the Co-executive producer Maril Davis, who came to the fans rescue and trashed the rumors further tagging it as a fake news. The producer put a rest to the rumors on Twitter after a fan tagged him and questioned him regarding the same. Also, spoilers for the third season reveal that Jamie will be seen with another woman while Claire would be returning to her own time to her first husband, Frank while being pregnant with Jamie’s child. 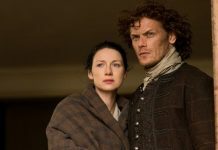 Claire will be seen reviving her new life and Jamie will be seen battling the aftermaths of a battle and would also try to settle without Claire in his life. How both Claire and Jamie will survive without each other, is the thing to watch in the upcoming series. On the other hand, the love saga of Jamie and Claire seems to continue on the sets of Outlander as well. Since reports are making rounds that Sam Heughan and Caitriona Balfe are getting way too comfortable on the sets. According to Star Post, both the actors were seen shopping in a mall during a break session from the extensive shooting of the third season further sparking dating rumors. A lot of photos were taken by fans and were made public online as well. Well, there is no official confirmation about the rumors by both the actors, till then we can only hope or speculate. 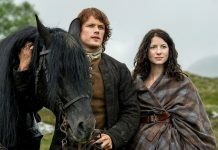 Outlander Season 3 is scheduled for release in September 2017.